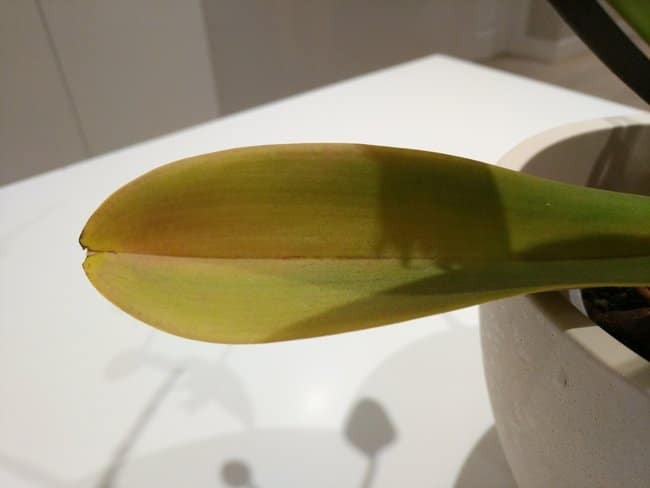 Blog Why Are The Leaves On My Orchid Turning Yellow? All healthy orchids will experience yellowing of their lower leaves on occasion, as old foliage dies back. However, yellow leaves can also be a sign of many different problems with your orchid. Why Are The Leaves On My Orchid Turning Yellow? The good news is, it’s really not too difficult to work out why an orchid is getting yellow leaves, but you need to know what to look for and how to treat it. In this article, I’ll cover the 10 common causes for yellow orchid leaves and the solutions to correct these problems. First a quick summary of the most common reasons why your orchid may have yellow leaves. In nature, orchids usually grow in indirect sunlight under the canopy of tropical forests. As a result, they are rarely exposed to strong direct sunlight. Therefore, when you’re looking after your orchid at home, you should ensure that your plant receives plenty of light, but make sure that it is indirect sunlight, rather than direct sunshine. A north or east facing window is ideal during the summer, and you could move your plant to a south or east facing window in the winter to ensure your plant gets sufficient light. If your plant is getting too much direct light, a sheer curtain or position away from a window may be more suitable. The photo above shows a plant that was kept in a south facing window all summer long. It bloomed profusely for many months over the summer, but if it had been left in this location, I doubt that it would have survived for very much longer. As an aside, if you want to know how long orchids typically bloom, check out my article here. As you can see there is evidence of fading and yellowing of most of the leaves, and also some evidence of scorch marks, cracks in the leaves and burnt leaf tips. Many of the roots also had evidence of sun damage. This plant has subsequently been moved to a more suitable location where it gets bright, but indirect sunlight over the last number of months. I have been able to observe the leaves becoming more vibrant, green and healthy looking. I hope the future is bright for this plant. Most orchids grow best in temperatures of between 60 and 80 °F (15 – 27 °C). This fits nicely with the temperature found inside most homes, and is one of the reasons why many orchids make such good houseplants. If the temperature regularly drops below 60 °F (15 °C), this will subject the plant to excessive stress. As a result you will notice progressive yellowing of the leaves and there may also be leaf drop. This can progress further to browning or blackening of the leaves, eventually leading to plant death. This is a fairly easy problem to correct, as it should be fairly obvious if your plant is being kept in a location that regularly falls below 60 °F (15 °C). If in doubt, you could consider getting a room thermometer. I’ve got a handy one that will show me the current temperature as well as recording the lowest highest recorded temperature since last reset, which helps me to get an idea of the temperature range of the room my orchid is being kept in. [amazon link=”B0013BKDO8″ title=”Here’s the one that I have” /] that I bought off Amazon. I haven’t had any problems with it and find it very useful. The other side of the temperature coin is of course excessively high temperatures. Although many orchids are found in tropical locations, they live under the tree canopy where the temperature is normally fairly moderate. This provides a climate that has a fairly steady temperature and high humidity levels, with a modest dip in temperature at night. When keeping orchids at home, you want to mimic this natural environment as closely as possible. Once the temperature gets regularly above 80 °F (27 °C), an orchid experiences excessive stress, causing reduced efficiency of its normal metabolic processes. As a result, the leaves will start to become yellow and if the problem is not corrected soon, will result in leaf drop and even plant death. Over watering is definitely the most common reason why the leaves on your orchid may be turning yellow. Over watering your orchid can result in root rot which leads to rapid death of the roots. Your orchid will then be unable to absorb water and nutrients, leading to a very serious situation for the orchid indeed. I’ll cover how to treat this a little later on in the diseases section. Most people have a tendency to over water their houseplants. It’s only natural, as we are all trying hard to care for our plants, and watering them usually feels like the right thing to do to nurture them. However, orchids in particular only require a small amount of water, so they are very easy to over water. You should only water your orchid once the potting medium is dry. If you want to learn the right way to water phalaenopsis orchids, I’ve written an article here. You can monitor this by poking your finger into the potting medium to test whether it is wet or dry. Only water your orchid if the potting medium is dry. Alternatively, you have use a wooden skewer to probe the potting medium. Be careful when doing this not to damage the roots. If the skewer is dry when taking it out, your orchid needs watered. If not, leave it another day or two, and test again. Another way to test if your orchid needs watered is to weigh it. With a bit of practice you should be able to get a feel for the dry weight of your orchid in the pot. You could even use kitchen scales to do this more accurately. Then you can have much more confidence you are watering your orchid at the right time. Personally, I use a combination of these methods, and always err on the side of under watering, rather than over watering. I’ve always found that my orchids have more of a tolerance for being slightly water deprived, rather than over watered. There is one reason for the leaves on your orchid turning yellow that is perfectly normal and nothing to worry about. This is when the lowermost set of leaves turn yellow and die back over time. This normally happens as an orchid develops new leaves and/or a new flower spike. It is perfectly natural for orchids to prioritise fresh growth, so if the plant feels that the older leaves aren’t required, it will start the natural leaf-shedding process. If the lower one or two leaves on your orchid starts to turn yellow, my advice is to do nothing. Leave them alone and let them slowly wither and turn increasingly yellow. The orchid will naturally seal these leaves off from the rest of the healthy plant and they will drop from the plant naturally. I wouldn’t blame you if you didn’t particularly that like the look of these yellow leaves at the bottom of your orchid, and I certainly don’t like them either. Some people will remove these leaves as soon as they start to turn yellow. While this is perfectly acceptable, you must be aware that manually removing the leaves from an orchid increases the risk of disease for the plant. What I tend to do is leave them alone until they look reasonably withered and yellow and I can be fairly confident that the orchid has begun the process of shedding this leaf. I will then use a sharp sterile knife to cut the leaf off at the base. I normally treat the cut with dilute hydrogen peroxide solution to reduce the risk of infection. I can’t say I’ve had too many issues with removing leaves in this way. Any sudden change in the environment or location of your orchid can lead to your plant experiencing stress. Your orchid may respond by dropping leaves or blooms, or in less severe cases, there may be yellowing of the leaves. This is most likely to happen when you bring a new orchid home from the store, or when you move an orchid from one location to another within your house. If this happens immediately after you bring it home from the store, don’t panic. There’s not much you can do about it other than ensure the location you have your orchid at home provides ideal growing conditions. You can’t be sure how the orchid was kept at the store or in transit in the supply chain. If the plant experienced stress in any way in the journey from the grower to your home, the response to this stress will be delayed by a number of days were up to a week or two. All you can do is try your best to salvage the situation. Preventing this situation is difficult, but you can take some steps to ensure that the store where you buy your orchid has provided a good climate for your plant prior to purchase. 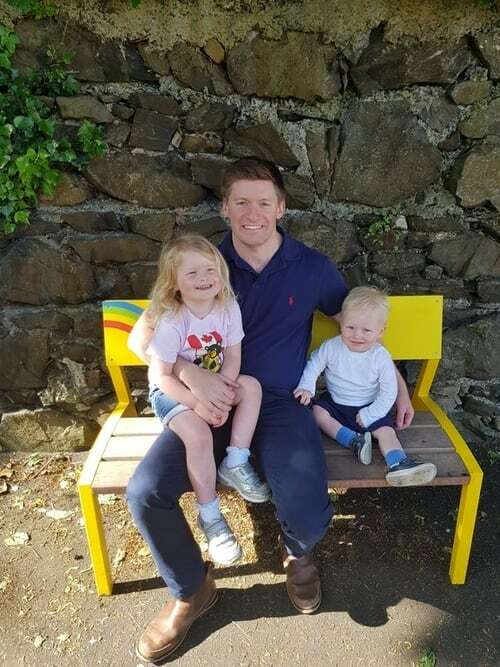 You could also enquire with the staff about how the plants have been cared for since arriving, where they came from, and whether they have had any problems with any of the plants recently. In terms of moving your orchid around your house, as long as you are aware of the required conditions for keeping orchids, then you shouldn’t go too far wrong. Hopefully by reading this article, you will be better equipped to identify any problems and correct them as quickly as possible. Despite their looks, most orchids are reasonably resilient and will cope fairly well with sub-optimal conditions. However, an issue that some people have identified is that their tap water can cause problems for their orchids. If you live in an area with particularly hard water, or if your tap water is treated excessively with chlorine or chloramine, you may find that your orchid will struggle or develop yellow leaves or leaf tips. Excessive levels of dissolved calcium and magnesium in hard water, can impair the ability of plants to absorb other essential micronutrients, leading to deficiency and various growth and leaf problems, including leaf yellowing. Chlorine, chloramines, fluoride and various heavy metals are often present in tap water in varying concentrations. Whilst most tap water is monitored stringently for these levels, to ensure that water is safe for human consumption, even levels safe for humans can cause stress and leaf yellowing to your orchids. 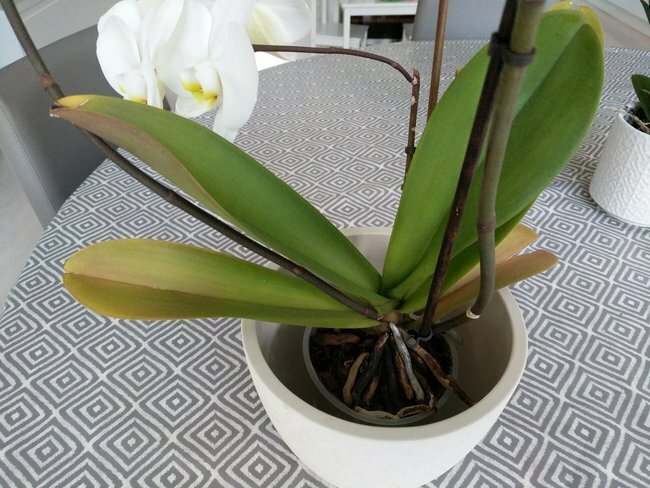 If you are really struggling to find out why the leaves on your orchid are turning yellow, it may be worth looking up your local tap water inspection results and considering using rain water or filtered water to water your orchid. Similar to over watering, most people have a tendency to over fertilize their house plants. I know I certainly did for many years, as I wanted my plants to be as healthy as possible, and didn’t really understand that too much fertilizer could be worse than too little. Excessive nutrients such as calcium, manganese, zinc, copper or phosphorus can prevent the uptake of iron by your orchid, which will actually cause symptoms of iron deficiency, such as yellowing of the leaves (chlorosis). Orchids are generally light feeders, and only need infrequent and dilute concentrations of fertilizer. My normal practice for fertilizing my orchids is to use a water soluble fertilizer which is at ¼ to ½ of the strength I would use on other houseplants. I actually tend to use a water soluble fertilizer that has been specially formulated for orchids. While this isn’t strictly necessary, it is very convenient and takes much of the guesswork out of the process. I fertilize my orchids every 1 to 2 weeks, but only during the vegetative stage. Once my orchids bloom, I stop fertilizing until all the blooming has ended. I also make sure to alternate watering my orchids with water alone and with fertilizer solution. This helps to avoid any build up of nutrient salts in the growth medium, which could otherwise lead to nutrient toxicity issues. As most orchids are sold when they are in full bloom, you shouldn’t fertilize your orchid for the first few months after you bring it home. Once the last blooms have dropped, you can start your fertilizing schedule to encourage vegetative growth of your orchid and development of a new flower spike. See my guide on how to make phalaenopsis orchids rebloom here. In the opposite scenario, there are many people who get orchids and don’t fertilize them at all. Whilst the potting medium will contain a certain amount of nutrients for the orchid, eventually this supply will run dry and even a light feeding orchid will start to show signs of nutrient deficiency. The most common deficiencies that will cause yellowing of your leaves are nitrogen, iron, zinc and manganese. This can be remedied by starting to use a suitable fertilizer. 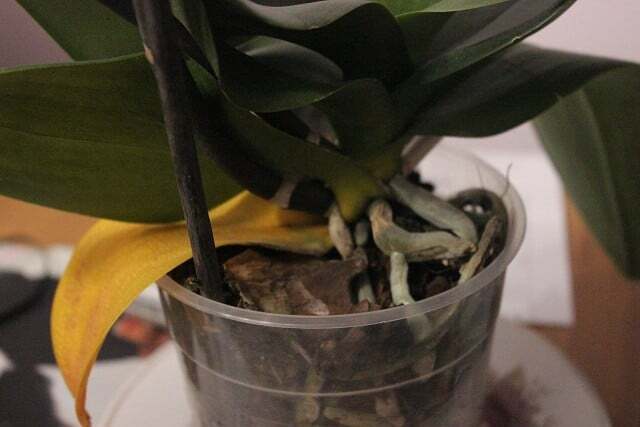 Yellow leaves can be a sign of disease in your orchid so you should bear this in mind when thinking about the causes for your orchid’s yellow leaves. Diseases are more likely to cause yellow spots and patches on your leaves, but generalised yellowing can happen too. This is the most common orchid disease that you will see. 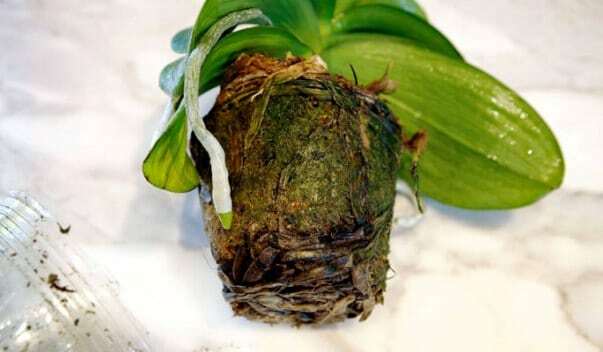 This is a fungal infection of the roots that will occur if you over water your orchid, or if it is growing in a poorly draining medium or a pot with insufficient drainage holes. Root rot can take hold very quickly and can vary rapidly kill a previously healthy plant. If you notice your orchid developing yellowing leaves, one of the first things you should do is inspect the roots. You can do this without removing the orchid from the pot, if the pot is transparent. If not, you will need to lift the orchid out of the pot and inspected the roots carefully. Roots affected by root rot will typically be brown or black, soft and fragile. If the plant still has some healthy roots, they can be saved, but you should remove all rotten roots with sharp, sterile scissors or secateurs. You can then repot your orchid in a fast draining medium, such as pine bark, in a transparent pot with plenty of drainage holes. See my article for more info. Going forward, you should only water your orchid once the potting medium is almost completely dry. This is another common infection which can cause yellow areas, which start on the undersides of leaves. Untreated, these yellow spots will enlarge and become brown or black and cause localised damage to the leaves. If your plant is only mildly affected, you can try treating this by spraying or wiping the affected leaves with a suitable fungicide. Generally, a better approach is to remove the affected leaves and dispose of them, before treating the healthy leaves with a fungicide, in case there is early, not yet visible disease on other parts of the plant, or spores, which could cause disease in due course. This bacterial disease, will cause irregular, wet looking yellow or brown spots on the leaves of your orchid. It is more common in orchids kept in hot and humid conditions. As the disease worsens, there can also be generalized yellowing of the affected leaves and this is a sign of the increased stress which the plant is experiencing. The best treatment for this is to remove the affected parts of the leaves, or all of the affected leaves, if the infection is severe. This should be done with a sterile blade or scissors. You should take care to make your cut into healthy tissue, to avoid spreading the disease. Once the affected foliage has been removed, you should take measures to prevent reinfection. Some people like to use a broad spectrum bactericidal spray, or fungicide, to prevent opportunistic fungal infection. An alternative, is to use a dilute 3% hydrogen peroxide solution onto the affected areas of the plant. This is a natural bactericide. Another tip is to carefully apply cinnamon along the cuts that you have made. This will cause dehydration of the cuts, reducing the risk of reinfection. For a bit more information about how to tell if the yellow leaves on your orchid are a sign of poor orchid health, or a natural part of your orchid’s healthy development, check out this excellent video tutorial from MissOrchidGirl. Many thanks for taking the time to read this article about causes of yellow leaves on your orchids. Hopefully you have also picked up a few tips to identify the cause and treat it when necessary. If you still can’t work out what the problem is with your orchid, try reading this excellent article from the American Orchid Society. 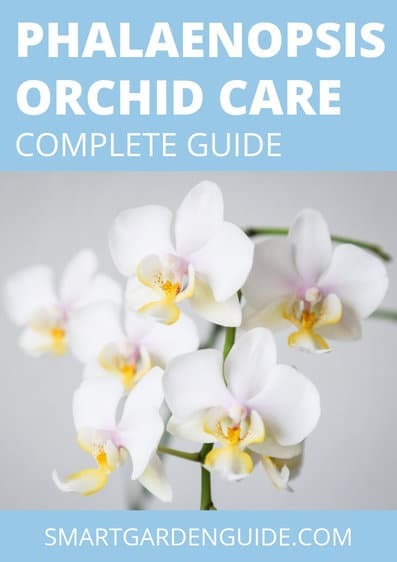 If you want to read more about how to care for phalaenopsis orchids correctly, check out my beginners guide here. Has anyone got any other good tips for treating or preventing yellow leaves on their orchids? Leave a comment below to share your experience.